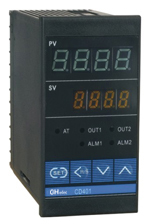 CD701 series is latest generation univeral intelligent temperature controller,it is more reliable and convenient for high exactness control use,Its main virtue is:wide range sensor singal input.wide range power supply,high excatness by PID ,high ability to prevent disturb ,etc. 4)Usage enviroment:0～50oC,30-85% RH,non-corrosive gas forum. After the meter is executed normally enter into parameter setting mode to find out parameter of data lock"LCK" and make its code set to "1000" with the final confirmation by pressing the "SET"key.Then put the "SET"key and key to be pressed simultaneously for about 3 seconds to make"Cod"shown on the PV display ,When God equals 0000,press"SET"key to make the following parameter achieved and displayed in turn.